Previously unseen sketches from Salford artist L.S. Lowry are to go on sale next week in London, with experts predicting the sketches could sell for £500,000 in total. The 28 pencil and charcoal etchings, some featuring Lowry’s iconic ‘matchstick men’, will go on sale at the LAPADA Art Antiques Fair, from 22 to 27 September. The owner’s father was a keen collector of art, however his wife deemed the sketches to be rather unattractive, and hid them away in a cupboard until they were discovered by their daughter in March this year. The daughter, who has since passed away, took them on BBC’s Antiques Roadshow, where she was shocked to find that the value of the pieces could be as high as £50,000 per piece. 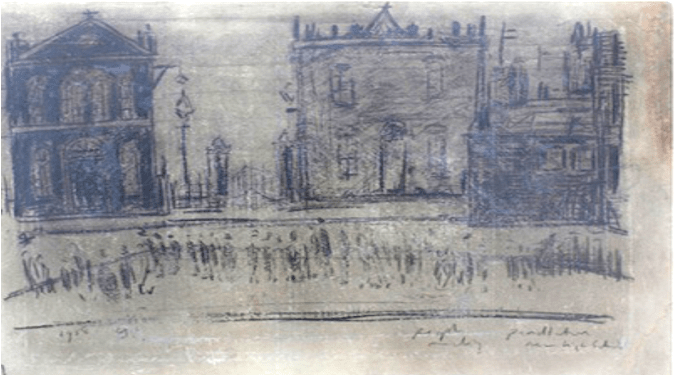 Dating from the 1920s to 1960s, the sketches range from sharp, impromptu sketches, to complete drawings which display Lowry’s unique drawing style. Highlights from the collection include his sketchbook cover, a street scene in Manchester dated April 3rd 1959, as well as a drawing of St Thomas’ Church in Pendleton. Lowry works have fetched high prices in the past, with a selection of works by the artist held by Cambridge businessman AJ Thompson sold at auction in March 2014 for a record £15 million. Michael Howard, author of Lowry: A Visionary Artist, said: “I was stunned by their quality as drawings. Each of them, in different ways, posses qualities unique to Mr. Lowry and represent him working at his very best”. 20,000 collectors and visitors from around the world are expected to attend over the five-day event. LS Lowry is one of Salford’s most iconic artists of the last century. He is most famous for his sketches and paintings of industrial Manchester and Salford. He died in 1976.